Mohandas Gandhi's 24-day March to the Sea, from March 12 to April 5, 1930, was a pivotal moment in India's quest to become an independent country no longer ruled by Great Britain. With over 70 marchers, Gandhi walked from his hometown near Ahmedabab to the sea coast by the village of Dandi. The march was a non-violent means to protest the taxes that Great Britain had imposed on salt - not the salt that the Indians could get from the sea, but the salt that Great Britain forced them to buy. Gandhi believed that peaceful protests were an effective way to challenge British law, and his peaceful but ultimately successful movement became known as Satyagraha. 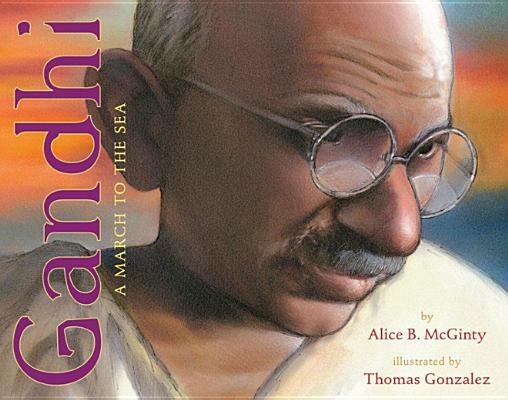 In free verse echoing the marching rhythm of Gandhi's historic journey, Alice McGinty recreates Gandhi's famous march, enhanced by Thomas Gonzalez's powerful paintings that capture the determination of a people longing to be free.